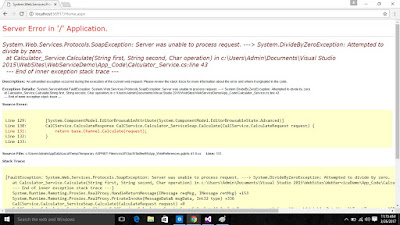 In this post we will learn how to handle Errors in Web Service. We will create a basic calculator with error handling techniques. 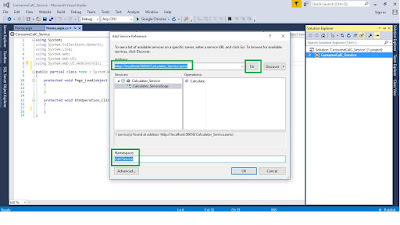 In previous posts we already learned What is Web Service, How to create a web service using c# , how to consume web service in asp.net. and how to host a web service in IIS. We already know how to create a and consume a Web Service in Asp.net and in this article we take one step ahead. Error handling is most important point for any application. 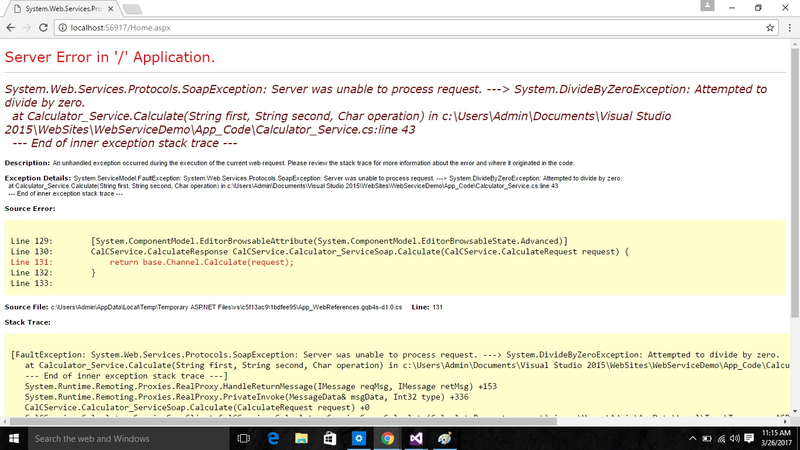 Because you can provide a error message according to your application using try catch . First we create a ErrorResponse class for responding the Result or ErrorMessage to our Application. Step 1. Right click on your service project and add a New class named it ErrorResponse and create two properties on this. Step 3. Build your service project run and test your Service directly. Step 4. Create a WebApplication for consuming this service. Here i named my application ConsumeCalC_Service and add your service reference from Solution Explorer Add reference. Step 5. Create a Web Form and do few code for according to created service. <td> <asp:Button ID="btnOperation"  runat="server" Text="Result"
<td><asp:Label ID="lblname" Font-Bold="true" Text="Your output is :"
Step 6. Now run your application and provide input in Text fields. 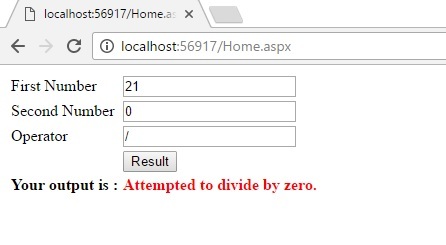 Here i divide 21 by 0 and it simply displayed error message in red text as i want to displayed. But what happend if we did not implement Error Handling in our service code, the answer is simple it breaks our code and user did not get what exactly happend. 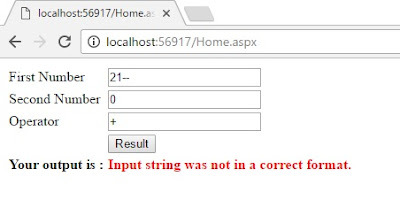 Now any type of error handled by our error handling class and it will not through exception directly to user but through a error message in response .